As Radovan Karadzic’s final verdict approaches next week, many of the 12 years he spent evading arrest remain shrouded in secrets that the Serbian and Bosnian authorities seem reluctant to probe, and people who helped him remain unprosecuted. On a weekday afternoon in the Serbian capital Belgrade, a small watering hole called Luda Kuca – the Madhouse – is crammed with elderly but chatty regulars. The walls are adorned with images of Bosnian Serb wartime leaders Radovan Karadzic and Ratko Mladic, alongside those of overthrown Libyan dictator Muammar Gaddafi, Russian President Vladimir Putin and former Serbian strongman Slobodan Milosevic. This was the bar that Karadzic used to visit in disguise before his arrest in 2008 and subsequent trial at the UN court in The Hague for crimes committed in the 1992-95 Bosnian war. Karadzic was sentenced in 2016 to 40 years in prison for genocide in Srebrenica, the first such crime on European soil since World War II, as well as the persecution of Bosniaks and Croats throughout Bosnia and Herzegovina, terrorising the population of Sarajevo and taking UN peacekeepers hostage. He has since appealed, and the final verdict is expected to be handed down on March 20 by the Mechanism for International Criminal Tribunals. The Madhouse patrons become less talkative at the mention of Karadzic, but claim they did not recognise him in his disguise. While he was in hiding in Belgrade, he was pretending to be a long-bearded ’spiritual healer’ called Dragan Dabic. “The man came around, drank coffee… Nobody knew it was him,” one patron says. The regulars recall an onslaught of journalists after Karadzic’s arrest on July 21, 2008, claiming that some 350 news crews descended on the bar, which is the size of a single-room apartment. Karadzic’s capture in Belgrade came 12 years after an international warrant was issued for his arrest, sparking a long manhunt. But gaps in the timeline of Karadzic’s fugitive years may remain forever, as Serbia and Bosnia have not been doing much to uncover his network of helpers while he was in hiding. In Bosnia, after an investigation that covered 58 people, only one was indicted for assisting Karadzic in hiding, and the process ended with an acquittal in January 2012. Nobody was ever indicted for helping Karadzic hide in Serbia. 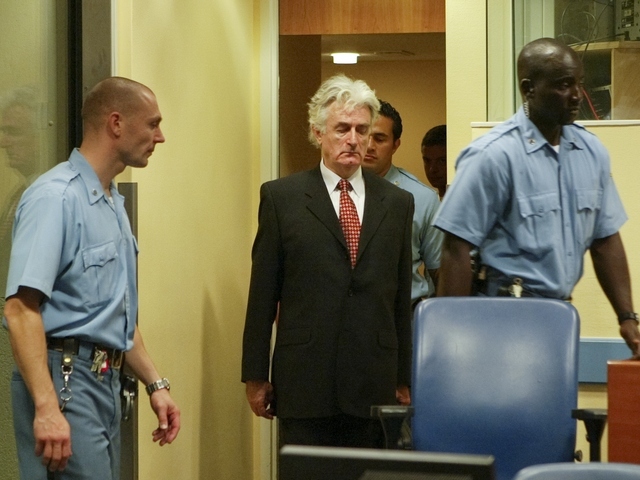 In 1995, the last year of the Bosnian war, the International Criminal Tribunal for the Former Yugoslavia filed an indictment charging Karadzic. In July 1996, he resigned as the president of Bosnia’s Serb-dominated entity Republika Srpska and the Serb Democratic Party, both of which he was involved in founding before the war broke out. Off-the-record information circulated suggesting that Karadzic spent the first years as a fugitive in Bosnia and Herzegovina, while NATO’s Bosnian stabilisation force SFOR and foreign security services searched for him without success. British journalist Julian Borger, author of a book called ‘The Butcher’s Trail’ about how the perpetrators of Balkan war crimes were captured, said there are various reasons for the failure to capture Karadzic in Bosnia before he crossed over into Serbia at the end of 1999. “Initially there was a lack of will power. The troops on the ground in 1996 and 1997 saw their job as peacekeeping and they didn’t want to risk casualties or reigniting the conflict. In 1998 and 1999, I think the skills of the hunters were outmatched by the cunning of the hunted,” Borger told BIRN. Karadzic himself said in a 2017 interview with the Serbian newspaper Vecernje novosti that after quitting the Republika Srpska presidency, he “moved around freely” on Bosnian Serb territory, believing that he had a “secret agreement” with the US envoy for the Balkans, Richard Holbrooke. The alleged agreement allowed Karadzic to avoid prosecution if he quit public life. Holbrooke denied ever giving such an assurance, however. After going into hiding in 1997, rumours circulated that Karadzic was living in monasteries, or in a variety of countries like Montenegro, Greece, Russia or Belarus. Borger said that he “would have loved to have got more detail on the 1998-1999 period”, as he has no information from Karadzic’s perspective. “I believe he spent time on the Montenegrin border and may have stayed in monasteries. His legal team hinted at that,” Borger said. After entering Serbia at the end of 1999, Karadzic allegedly hid in the northern city of Novi Sad before moving to Belgrade, where he adopted the identity of Dragan Dabic, a self-styled spiritual healer. After completing a parapsychology course, Karadzic started to give lectures and work as a consultant for private health companies. According to Borger, he was able to hide the fact that had moved to Serbia because he had help from some officers of the Serbian Security and Information Agency, BIA, who also created the identity of Dabic for him. He says the CIA suspected Karadzic was in Belgrade from about 2000, but didn’t have the local help it needed to track him down. “Dabic was a successful disguise because it was so outlandish. No one in their right minds expected to see this war crimes fugitive as a New Age healer,” Borger said. Karadzic set up a (now defunct) website, dragandabic.com. It contained a fake biography of Dabic, presenting him as having been born in a small town in central Serbia where, as a boy, he would “explore nearby forests and mountains, spending a lot of time on mount Kopaonik where he tended to pick the omnipresent, natural and potent medicinal herbs that grew in those green pastures”. Some of his clients had praise for ‘Dabic’ even after his true identity was revealed. One of them, Danijela Balaban, told Kurir newspaper in 2008 that he helped her autistic son, Danilo. “I am sorry because I know he helped my son. I do believe that Danilo could speak if Dabic could have continued helping him,” she claimed. It was while posing as Dabic that Karadzic, who lived in the New Belgrade district, started visiting the Madhouse bar in disguise, sometimes playing a Montenegrin single-string instrument, a gusle, to the accompaniment of which epic poems are sung. Karadzic saw the political situation in Serbia change over the years. He was there when Milosevic was ousted after mass protests on October 5, 2000, and when the anti-Milosevic opposition leader Zoran Djindjic, who became prime minister, was assassinated in 2003. But his time in hiding was finally up in 2008, when the leadership of the BIA changed under a Democratic Party-led government. The BIA’s new head, a young former police chief called Sasa Vukadinovic, was not part of the wartime cadre in the security services and had previously worked on investigating organised crime. Just days after Vukadinovic took office, the operation to arrest Karadzic arrest was successfully implemented. On July 21, 2008, BIA agents followed Karadzic onto a public bus, then walked him off the vehicle and into custody without a struggle. He was then sent to The Hague to face trial. Serbian security expert Aleksandar Radic said he believes the reason why Karadzic remained at large in Serbia for so long is a combination of his good disguise, a lack of will from the post-Milosevic authorities to arrest him, and the continuing influence of wartime cadres who stayed in power in agencies like the BIA. “We had [political] powers that remained from the war who didn’t have the motive to allow Karadzic be extradited, and on the other hand we had powers who saw the issue as something they could trade for Western support,” Radic told BIRN. He added however that Karadzic himself also invested a lot of effort to remain hidden. Asked why Serbia never prosecuted those responsible for helping Karadzic hide, Radic suggested that the revelations that emerged from trial would have been unpleasant for many people in government at the time who “either directly, or indirectly by being passive, shared responsibility”. “It’s the ‘dirty laundry’ from the past that, just like many other topics, we were trying to bury,” Radic said, adding that practically all senior Serbian political figures after the fall of Milosevic in 2000 were more or less involved with how the Karadzic situation unfolded. Dozens of people were either removed from public office or had their assets frozen by Bosnia and Herzegovina’s Office of the High Representative, the country’s international overseer, for helping to hide or finance fugitives from the Hague court, including Karadzic. Among them were senior Bosnian Serb figures like former Bosnian Serb presidency member and Republika Srpska president Mirko Sarovic, former Bosnian Interior Minister and war crimes defendant Momcilo Mandic, former Serb Democratic Party official Milovan Bjelica, Serb Democratic Party co-founder and ex-mayor of Trebije Bozidar Vucurevic, former Republika Srpska Interior Minister Zoran Djeric, and former head of the Bosnian Serb Army veterans’ union Pantelija Curguz. They also included former police officials like Tomislav Kovac, Dragomir Andan, Predrag Jovicic and Milomir Malis, plus several businessmen and Karadzic’s wife and son. Momcilo Mandic was eventually sentenced to five years in prison for his involvement in corrupt practices at the Privredna Banka Srpsko Sarajevo, but acquitted of crimes related to assisting Karadzic due to lack of evidence. Mandic told BIRN that the case was all about “Western propaganda” and the will of the international community and pro-Western Serbs. He insisted the charges were political and that he broke no laws. “I was sentenced for the bank charges, because they thought that I gave loans to companies which helped Hague fugitives, including Karadzic,” Mandic said, although he insisted he did not loan money to the suspect companies. A few years ago, the prosecution said that an investigation into 58 people for offering financial support to Karadzic had been discontinued because there was no proof of any crimes, and the people under investigation cooperated with the Hague Tribunal. Serbia, on the other hand, never brought any charges and it is unknown if it ever investigated anyone for aiding Karadzic. Bosnian lawyer Asim Crnalic said that it would now be hard to prove that someone assisted the former Bosnian Serb political leader while he was on the run. “That is a rather difficult procedure, particularly after so much time. He could not have been hiding for so many years without helpers, but the necessary efforts were not invested in determining who helped him,” Crnalic said. “Not even today do we know the real truth about where he was and who he was staying with,” he added.